But I posted it for you on Monday because I didn’t want it to feel inauthentic if I posted it any later. That’s the thing about these lately post’s. They vary greatly depending on the day and my mood. Sometimes happy, sometimes sad/depressed. I’ve realized the more honest I am/show my inner (yikes) Bethany, the better of a response I get from all you great folks. Thank you all for being my therapist and my journal entry. I have been living the most hectic life for the past 4 months since becoming a yoga teacher and even though I forget what it’s like to have a free night or weekend I wouldn’t trade it for the world. This journey has been incredible and the friends and yogi’s I’ve met along the way have surpassed any wish I could have had about chasing this dream. Yes, I wish I had more time in the day to spend on my blog, connecting with friends/family or going to the grocery store to wander (Whole Foods, I’m lookin’ at you). But I know that this is just a season and I thank God for Mikey and his calm to my storm. If he has taught me anything over the past for months it is PATIENCE. I don’t like being patient. I’m a Millennial, I’m not supposed to be patient. I’m supposed to do everything all at once and get what I want when I want it in return, right? As Omarion so wisely put it, “That’s how it post to be”. SO cheers to a summer that has been the best, although it ain’t over yet. Cheers to learning to be patient and enjoying the world around me. And cheersssss TO THE FREAKIN’ WEEKEND! My plan for the weekend is to bake, cook, eat and sleep. This is a weekend of relaxing and prepping for next weekend up in WI with my besties. My 3 best’s from high school and their mate’s are all heading up for our 10 year high school (ew, gross, how has it been 10 years) reunion/some fun in the sun. I hope you have some plans to relax over the Holiday weekend before the craziness of back to school/fall events begin. I must be hungry because I’m sharing a lot of food in this lately post…but life is about sharing food together, right? 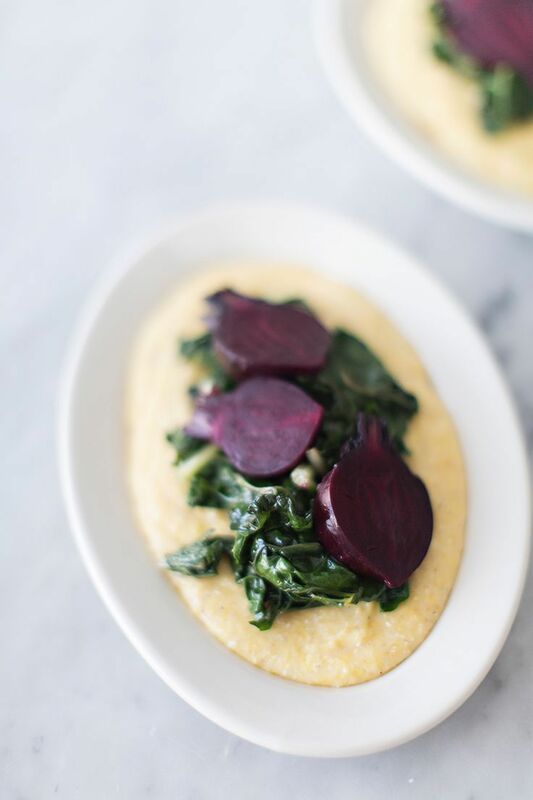 Food like this beautiful polenta from my new favorite FAVORITE website. If I could live in a website/kitchen/blog it would be Sunday Suppers. They have cookbooks. I want to buy them all and be a part of their team. It is literally everything I have inside my brain. Karen Mordechai (the founder) is my spirit animal (so is Kristen Wiig). Moving right along. 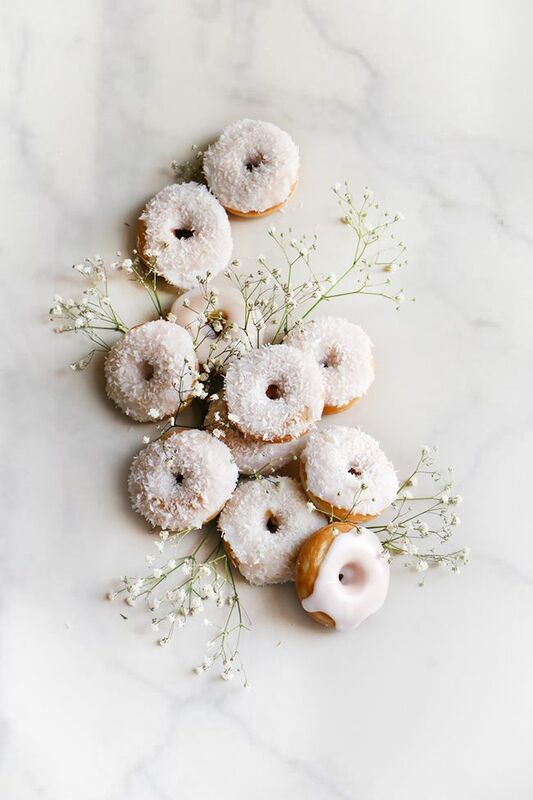 Obviously donuts with coconut. And who is surprised that they are from a blog in any language other than English. I have a knack for finding favorite posts in a foreign tongue. But if you ask me, food speaks all languages and we don’t have to understand each other to appreciate and stuff our faces full of great things together! I don’t know where this picture came from…but when I found it the link took me to a website about buying a home in Spain. Mikey and I fell in love in Spain so that can only mean one thing, it’s a sign and we need to buy a house there. And if living in Spain means lying in a boat by the sea with beautifully manicured toes…sign. me. UP. Yes, another breakfast food. IT’S ALL I WANT. I want breakfast carbs for all my meals every day. 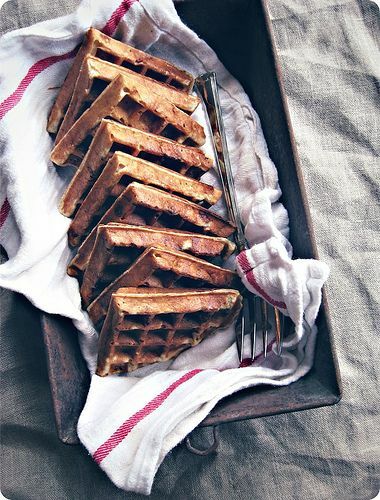 Add a bagel, muffin, baguette or waffle to everything I ever eat, please. My hair is a hot mess. It’s an afro of knots due to the fact that I went platinum in the winter and it is now fried to oblivion. Top knots are one of my only options and I am thanking my lucky stars that my hair style of choice is actually trendy right now. I know it won’t last forever and I’ll be the woman who is stuck in her hair generation forever (like the women with the 80’s bangs/layers like Farrah Fawcett that they just can’t seem to shake). I have been rocking a high bun since Jr. High and I don’t plan on stopping. I love the site Honestly WTF and I know I share things from there often (like, maybe even this same post) and I hope they keep it up because the inspiration they are throwing off is magical.